Race Car Park will close at 7:00am – no cars will be allowed to exit the Race Car Park under any circumstances until the last cyclist has returned which will be around 11:30am. 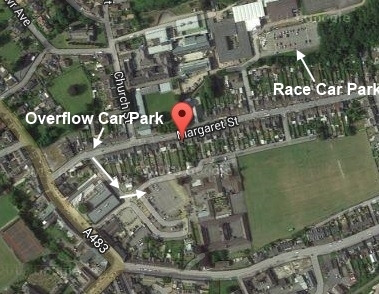 We strongly recommend that all athletes park in the Overflow Car Park. This will be clearly signed and is referred to locally as the old Co-Op car park and is situated by the Ammanford Bus Station. Please don’t park in the new Co-Op! Parking will cost £1.00 for 4hrs and only £1.50 for 10hrs.